Kseniya Ryabinkina in 'Mera Naam Joker'. Kseniya Ryabinkina, who played a trapeze artist in Raj Kapoor’s magnum opus, will participate in a special program to mark the birth anniversary of the legendary Indian actor and director. A special programme is being organised by the Russian Centre for Science and Culture, Mumbai and the Enlighten Film Society on Dec. 14, Kapoor’s 92nd birth anniversary. Raj Kapoor’s son, actor and director Randhir Kapoor, and Svetlana Roshchenko, director of the International Cultural Relations Association, Moscow, will take part in the event, which will be followed by a screening of the film. Ryabinkina, who turned 71 this year, started her career as a ballerina in Moscow’s Bolshoi Theatre. It was her role as Marina in the Hindi film that propelled her to fame in both India and Russia and helped her launch a film career. An Indian film-going audience got acquainted with the Russian language for the first time by watching the film. The first interactions between Raju (Kapoor) and Marina (Ryabinkina) in the film were in Hindi and Russian. They managed to learn a bit of each other’s languages as the film went on. There was also a visible effort to promote Indo-Soviet friendship in the film with depictions of the amicability of the Russian circus artists. There is also a ‘lecture’ from Mahendra (Dharmendra) to Raju about how the Russians were “our friends” and how he shouldn’t give false hope to Marina about a potential relationship since the countries were so far apart geographically. Raju and Marina painfully say goodbye and kiss on the tarmac of the Santa Cruz airport, as the latter leaves for Moscow. An Indian audience was probably not ready for the 255-minute long film in 1970. It was a commercial failure that had a major impact on the fortunes of Raj Kapoor. The film did somewhat better in the Soviet Union but did not come close to the popularity of ‘Avara’ or ‘Shri 420,’ says Griko. “Over time it has come to be seen as of the great classics of Indian cinema, and audiences worldwide appreciate it for its cinematic brilliance,” Griko adds. A heavily abridged and re-released version of the film in the 1980s was well received by critics and audiences alike in India. In 2009, the Russian actress made her return to Bollywood. Ryabinkina acted in ‘Chintuji,’ a film that was loosely based on incidents from Rishi Kapoor’s life. The Russian actress played the role of the wife of the Uzbek Vice-President. In the film, she visits a shrine in India and recalls that it was the same place where she had once shot for a film with Raj Kapoor. Rishi Kapoor plays the role of a budding politician. Rishi Kapoor (Raj Kapoor’s second son) played a critically acclaimed role in ‘Mera Naam Joker.’ He met Ryabinkina during the shooting of the film. "We both very young when we did Mera Naam Joker. During shooting of Chintuji, we spoke a lot about the days gone by," Rishi Kapoor, told the Indian Express. “When the offer for Chintuji came I was more excited about meeting Rishi than acting in the film,” Ryabinkina told the paper. Although she plays the role of an ailing woman in the 2009 film, the Russian actress is in good health and still mentors ballerinas and actors in Russia. Given the fact that Raj Kapoor is still seen as a cultural icon by the older generation in Russia and much of the Soviet Union, film critics says it’s only fitting that Ryabinkina participates in the event in Mumbai to mark the legendary actor’s birth anniversary. 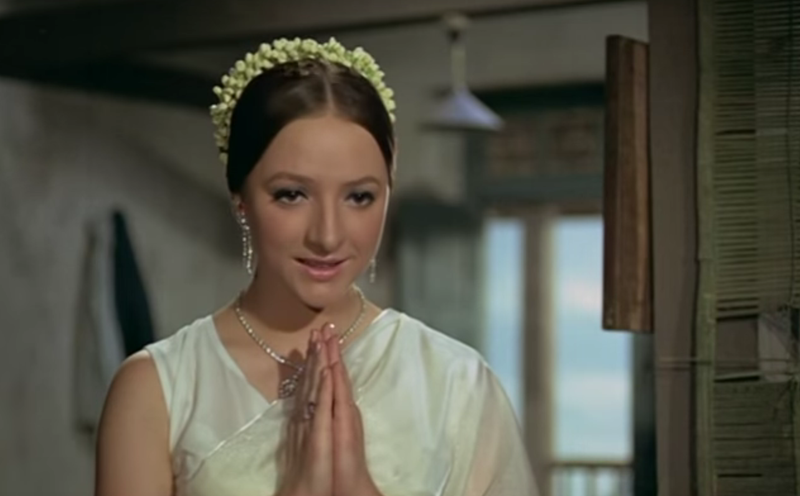 Till date, Ryabinkina’s role remains the most prominent of any Russian artist in an Indian film production. The programme dedicated to Raj Kapoor’s birth anniversary will be held at 6:00 pm on Dec. 14, 2016 at the Bombay Art Society’s auditorium in Bandra (West). It will be followed by a special screening of ‘Mera Naam Joker.’ Entry is free on a first come, first served basis.